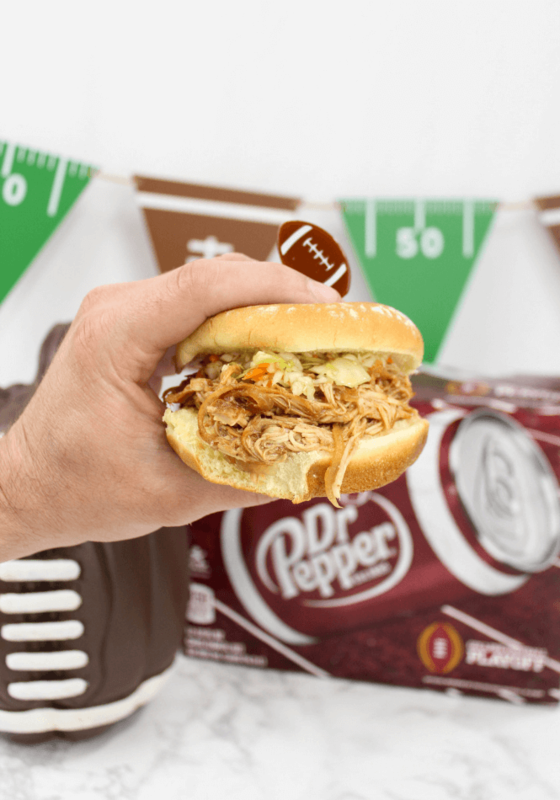 Slow Cooker Dr Pepper Pulled Chicken Sandwiches are made with chicken slow cooked with onion, BBQ sauce and Dr Pepper® topped with a vinegar and oil coleslaw in a hamburger bun for a simple game day meal. Ten-hut! Fall is officially here which means college football season is in full swing! Time to huddle up with your friends to plan the who, what, when and where for tailgating and football viewing parties for the season. 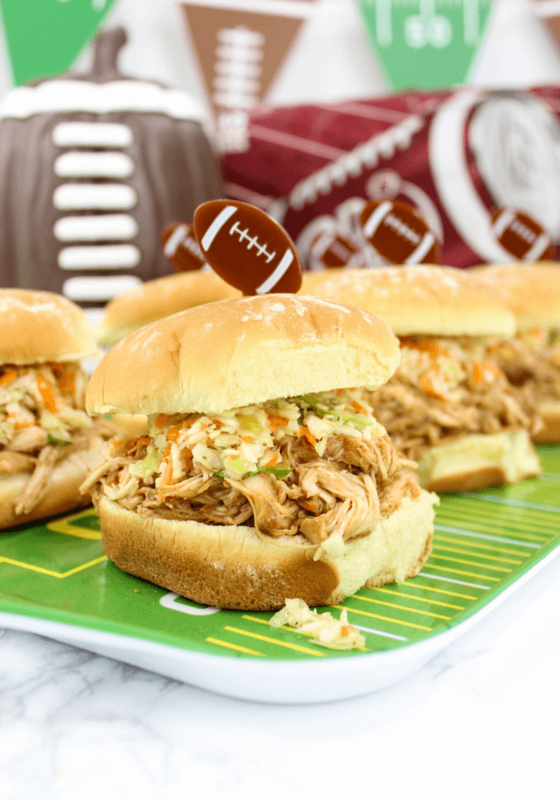 These Slow Cooker Dr Pepper Pulled Chicken Sandwiches are guaranteed to make you the MVP among your friends and family for Saturday football, along with just a few hosting tips! Keep it simple and casual. Saturdays are for relaxing even if a big game is on. When hosting, let people kick their feet up and take it easy. May your food be warm and drinks stay cold! Stock the fridge with Dr Pepper and serve something warm for the main dish. Snacks galore! Chips, dips, pretzels, peanuts, and a cheese platter set out next to television are a must. Clean and restock the bathroom. Toilet paper, hand soap, clean hand towels and some air freshener are on the Dollar General shopping list. Make sure there is seating for everyone. Move the couch, bring in some extra chairs or whatever you need to do to make sure everyone has a comfortable seat. More snacks. Make sure there is no way the snacks will run dry before the 4th quarter. Overestimate the amount of food and drink you will need and keep the snacks flowing. The main stop for game day snacks, drinks, cleaning supplies and a few fun decor items is Dollar General for a quick, convenient shopping experience with great prices. I already had chicken in the freezer that just needed to be thawed out so this entire game day meal was a breeze. Ingredients: vinegar, vegetable oil, onion, carrots, cabbage/coleslaw mix, sugar, salt, celery seed and BBQ sauce. 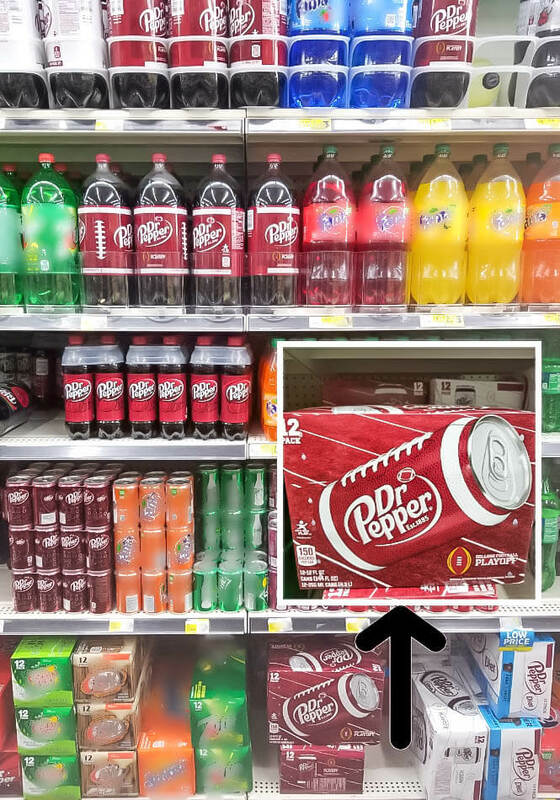 Stock up and save on Dr Pepper each time you visit Dollar General! 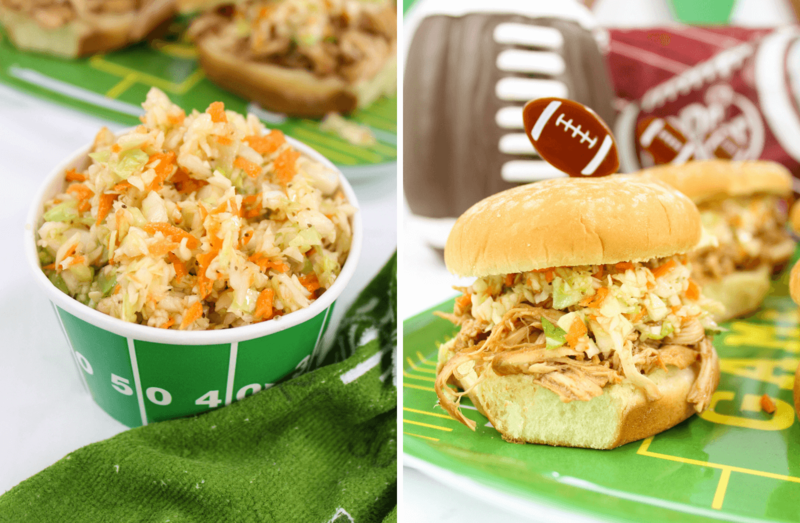 The mix of sweet Dr Pepper Pulled Chicken with the tang of a vinegar coleslaw are the perfect combination for a game day sandwich. These sandwiches are mouthwatering and just SO DARN DELICIOUS. The secret ingredient to these winning sandwiches are the Dr Pepper. Adding Dr Pepper with its rich, indulgent, one of a kind flavor makes meat so tender and adds that really nice sweetness that you and your friends are going to love. 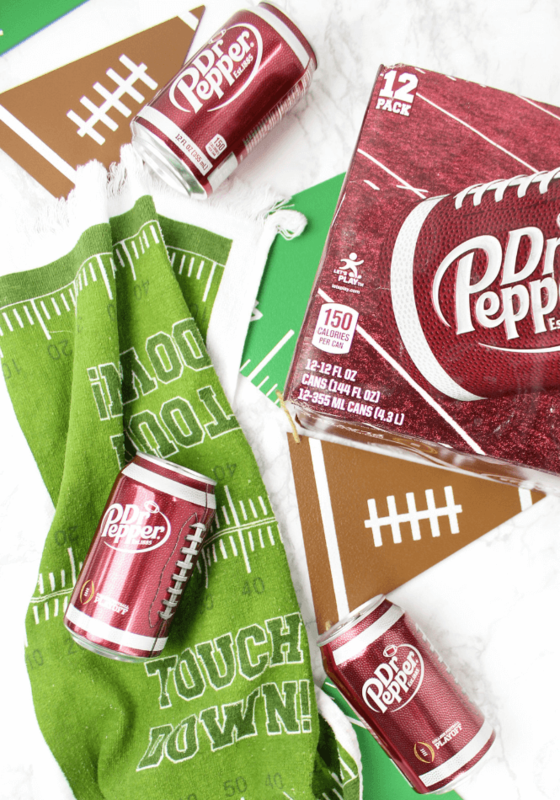 Dr Pepper is the official drink of college football fans and a great way to create yummy recipes with its 23 flavors packed inside every can. 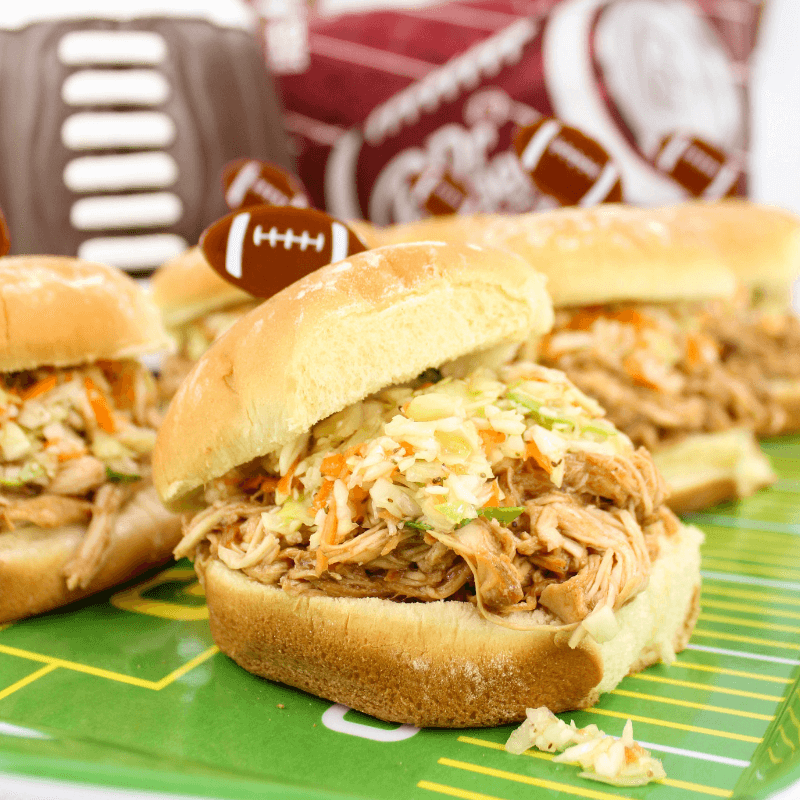 Slow Cooker Dr Pepper Pulled Chicken Sandwiches are made with chicken, slow cooked with onion, BBQ sauce and Dr Pepper® topped with a vinegar and oil coleslaw in a hamburger bun for a simple game day meal. Place chicken into the slow cooker. Dice a yellow onion and place on chicken. Pour in a bottle of BBQ sauce, followed by a can of Dr Pepper. Cook on low for 6 hours. As the chicken cooks, prep the coleslaw. Start by washing the vegetables well and peel the carrots. Quarter the cabbage head and put into a food processor. Pulse until the cabbage is shredded and place into a mixing bowl. Grate the carrots and slice the green onions. Add to cabbage. Dollar General has packaged coleslaw if you want to save time! Two bags will equal a head of cabbage. In a small bowl, add sugar, salt, celery seed, vinegar and oil. Mix well and add to the bowl of cabbage. Stir, cover and place in fridge until the chicken is fully cooked. 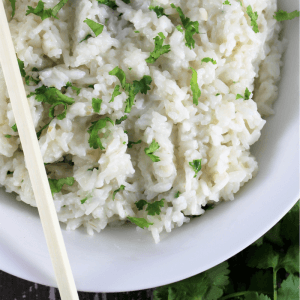 Remove chicken from slow cooker and shred in a mixing bowl. The chicken should shred easily with just a fork. Add 1 cup of BBQ sauce and 1 cup of the liquid and onion from the crock-pot. Mix in with the shredded chicken. Place a heap of chicken on a hamburger bun, followed by some coleslaw. Serve with a side of coleslaw and a cold Dr Pepper. Hosting game day is pretty relaxed. No need to be a perfectionist and scrub every inch of the house. Do a quick clean of the house making sure the bathrooms are stocked, set up the television viewing area with plenty of seating and prep some food. 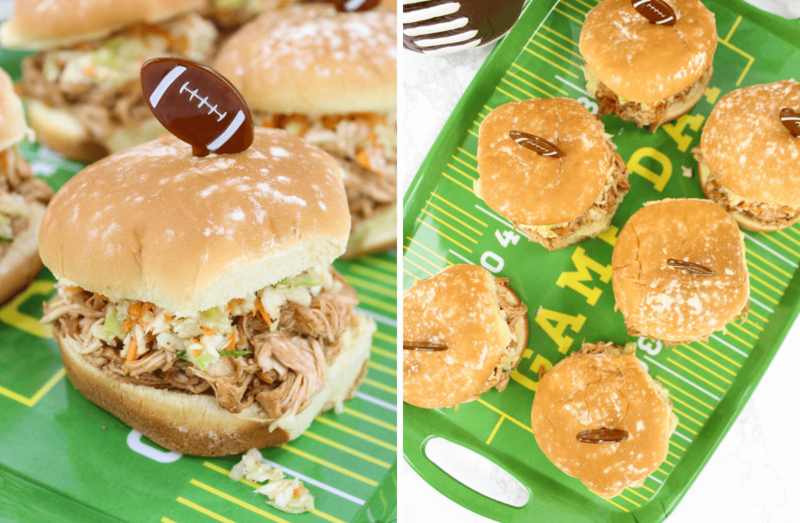 Begin your Dr Pepper Pulled Chicken Sandwiches 6 hours before kick off, make sure the drinks are cold and have plenty of snacks available! Do you have any hosting tips for game day? Share them in the comments below. These sound great! I love how easy the pulled chicken sounds. Dump and go- doesn’t get much easier! That looks amazing! And I bet Dr. Pepper would go really well with this! What?! 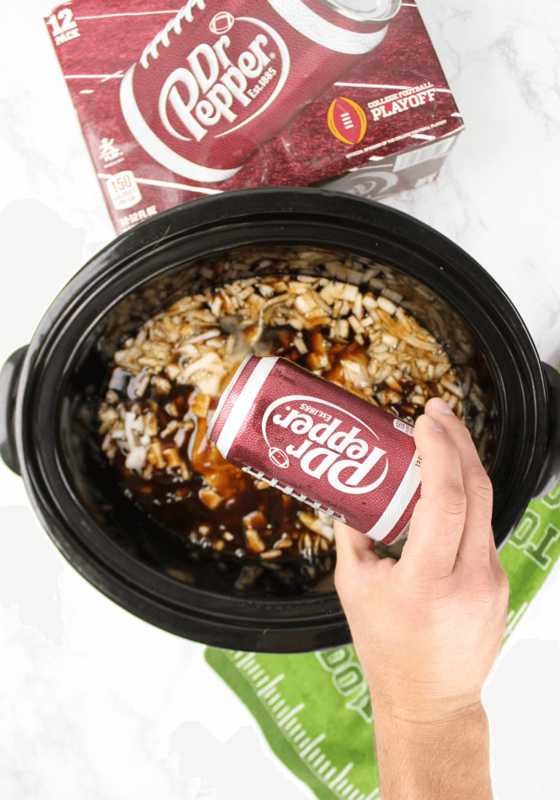 I have seriously never heard of using Dr Pepper or other pop in a crockpot recipe. I’m so surprised! Oh you need to try it! Soda makes the meat so tender.